On July 11, 1939, in a sharecroppers shack without electricity or running water in Willow Springs, NC, Caretha Leach, with her mother as midwife, gave birth to her fourth of ten children, Clara Leach. From this humble beginning, Clara Mae Leach Adams-Ender rose to achieve the rank of Brigadier General in the U.S. Army and led over 22,000 nurses in the U.S. Army Nurse Corps. Along with her nine siblings, Adams-Ender spent much of her childhood working in tobacco fields earning money for the family. As a result she missed a lot of school. However, her parents understood that it was only through education that their children could break free from the choke hold that tenant farming imposed on their own and many other African American families in that era. In an interview published in Notable Black American, Adams-Ender recalled her parent’s belief that she could do anything she wanted if she put her mind to it. As the result, Adams-Ender became a passionate student. In order to make up schoolwork she missed while working on the farm, she had classmates give her assignments to her school bus driver, who would drop them off as he passed her house on his route. Adams-Ender’s dedication paid off. She graduated second in her class from Fuquay Springs Consolidated High School at the age of 16. In the fall of 1956, Adams-Ender entered the North Carolina Agricultural and Technical College (NCA&T) in Greensboro. She was there at a pivotal time in U.S. history. Until the Civil Rights movement of the 1960s, the former Confederate States, including North Carolina practiced strict racial segregation. By law and custom, owners of public accommodations such as restaurants, motels, movie theaters, public parks, schools and hospitals denied service and/or admission to African Americans. While the Civil Rights struggle has been continuous in the United States since the end of the Civil war, it reached a turning point in the 1960s. Students from NCA&T are often credited with launching a new and crucial tactic in the modern Civil Rights Movement, the sit-in. On February 1, 1960, four male students from NCA&T went to the lunch counter at the local Woolworths store and sat down to order a meal. At the time, African Americans could receive service if they entered through the back door of the store, stood up while placing an order and then took their food off the premises to eat it. The students were denied service and returned to campus to publicize their actions. The next day twenty NCA&T students went to the Woolworth lunch counter to “sit-in”. Each day the number of people sitting - in grew as more students from NCA&T and other local colleges took a stand against segregation. Initially, Adams-Ender considered a career in law, however, her family’s financial situation influenced her to take an Army Student Nurse Program scholarship to pay for her last two years of college. In return for college scholarship monies, upon graduation she became a U.S. Army nurse at the rank of 2nd Lieutenant for two years. Adams-Ender graduated from NCA&T in June, 1961 earning her Bachelor in Science in Nursing degree and after passing her state board of nursing examinations, joined the Army in August 1961. She found the life of an Army officer agreed with her. She traveled around the globe serving in various Army hospitals. At different postings throughout her Army career, she furthered her education. In 1969 she earned a Masters of Science in Medical-Surgical Nursing from the University of Minnesota, in 1976 she earned another master's degree in military arts and sciences, from the Army Command and General Staff College (ACGSC) at Fort Leavenworth, KS and finally she earned a diploma in management relations and leadership in1982 also from the Army Command and General Staff College at Fort Leavenworth, KS. 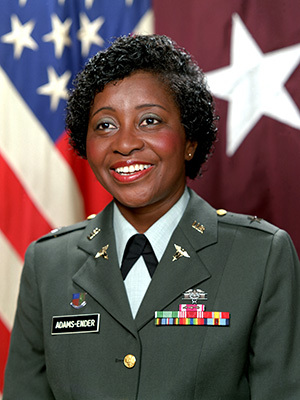 She served as an officer in the U.S. Army Nurse Corps from 1961 to 1993, rising to the rank of brigadier general in 1987. She was chief of the Army Nurse Corps from 1987 to 1991, and retired in 1993 as the commanding general of Fort Belvoir, Virginia. Among the awards bestowed on Adams-Ender are the Distinguished Service Medal with Oak Leaf Cluster, Legion of Merit, Meritorious Service Medal with three Oak Leaf Clusters, and the Army Commendation Medal. She retired from military service in 1993. In 2001 she published an autobiography, My Rise to the Stars: How a Sharecropper's Daughter Became an Army General. In 1981 she married Dr. F. Heinz Ender. Appalachain State University. Brigadier General Clara Adams-Ender. https://nursinghistory.appstate.edu/biographies/clara-adams-ender. (Accessed Mar 23 2017). Adams-Ender, Clara & Walker, B.S. (2002) My Rise to the Stars: How a Sharecropper's Daughter Became an Army General, CAPE Publishing. Clara Adams-Ender Papers held at UNC-G library.